Enter the password in the corresponding field. Select the hash type: LM or NT. Please remember that beginning with Windows Vista operating systems store passwords as NT hashes by default. Select the computer type. 'This computer' indicates your computer's search speed. The quality of your password, along with the time that would take your computer with the selected configuration to break it will be shown at the bottom. For example, breaking any LM hash of an alphanumeric password would take about 10 minutes on a modern CPU (at the search speed of over 100 mln. 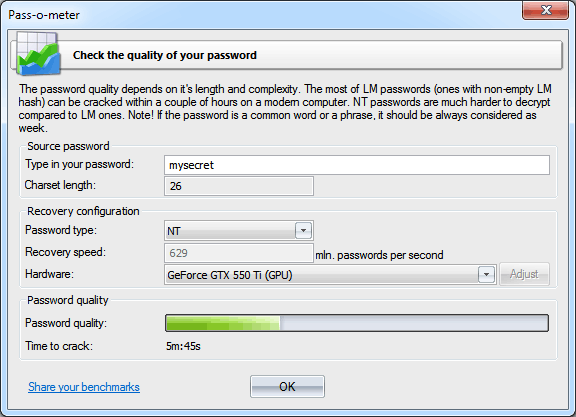 passwords per second). The search speed on a GPU can raise by another order of magnitude. We would be grateful if you let us know the speed you've reached on your computer.